Laura Tusken of Inspiration for Moms loves decorating her home for Christmas, especially the outside, because it’s the first thing guests see. Lauren shares simple steps to help create lasting impressions when it comes to Christmas cheer and outdoor holiday decor. When it comes to Christmas decorating, just call me Clark Griswold. Every year I can’t wait to get the Christmas decor up! Maybe my eagerness comes from the fact as a child, my parents never decorated the outside of our home. I would ask (or actually beg) and it never happened. So as soon as I bought a home of my own, I was already planning my outside Christmas decor! I do try to limit myself and not decorate so crazy that the electric company stops by for a visit. So when The Home Depot reached out to me and asked if I would like to be one of the bloggers in the 2018 Holiday Style Challenge, I couldn’t respond fast enough! I like to start decorating with the front door of our home because it’s the place all the guests will see first, and I want it to be perfect. If you are looking for ideas on how to decorate your front door for the holidays, I have a ton of tips to walk you through the whole process step-by-step. One of my favorite ways to welcome my guests is with a pretty layered rug/mat combination. I started with this gray indoor/outdoor rug as my base. 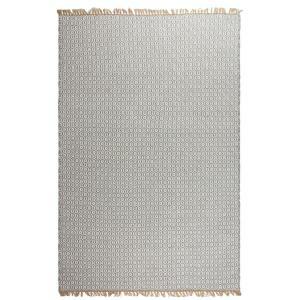 This rug is so soft and I love it’s stylish pattern. It looks great here on the front porch, but I’m also super excited to place it inside as well. 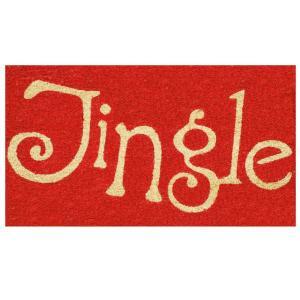 I topped the rug with this fun coir holiday jingle door mat. The pop of red this mat adds to the front door is perfect! Once the rug and door mat were in place, it was time to add some pretty details to the step. I decided to use my black urns for flanking the sides of the step. To give them some holiday cheer, I filled them with these decorative sprays. The added detail on these sprays is so pretty. 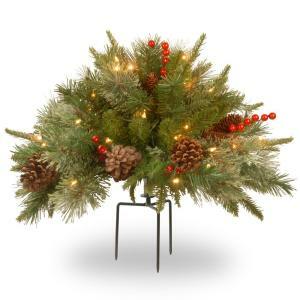 They’re trimmed with pine cones, red berries and about 35 warm white lights. 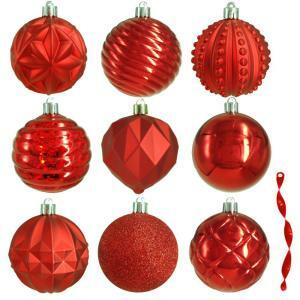 For a little extra pop of red and texture, I added a few ornaments. Can I let you in on a little secret? 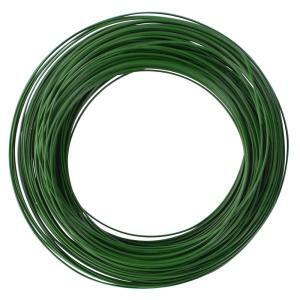 Green floral wire is your best friend when it comes to outdoor holiday decorating. 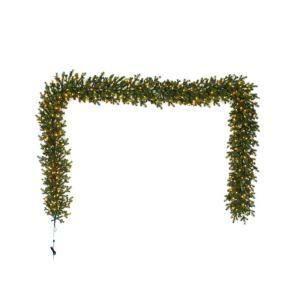 I used this wire to attach ornaments to the branches of each spray. No matter what winter storm the winds bring in, my ornaments are staying put! There’s a little side area to the left of our front door that needed some Christmas cheer too. A super elegant Christmas wreath and a couple of over-sized large letters were the perfect combo for this space. I arranged them down the side of the door wall to spell out the word JOY. I had a lovely neighbor stop by on her walk when she saw me photographing the front door. As she approached the house, she kept commenting on how nicely I decorate. As she got closer, she let out a little shriek! ‘Oh! It says JOY! I didn’t notice from the street. But now that I’m closer I can see it. That’s such a lovely surprise!’ Nailed it! The final touch I wanted to add to the front door was some beautiful fir garland around the front porch door opening. To keep with my red theme, I included a pretty red Denver plaid ribbon (seems fitting since I am in Colorado!). I simply wove it in and out of the garland. I then used the remainder of the ribbon to make a large bow for the center. After the ribbon was in place, I added three-ornament clusters for an additional pop of color and texture. The clusters were created by threading the ornaments onto green floral wire. 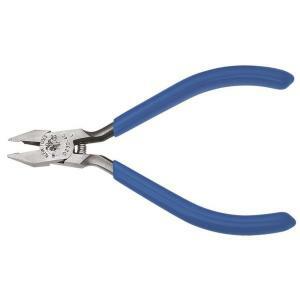 I then cut the wire with some wire cutters and twisted the wire to secure them together. Then I attached the clusters to the branches of the garland. Once again, that green floral wire is going to save the day. I attached some to the garland and wrapped it around the porch pillars and twisted to secure. That garland isn’t coming down until I say it’s time! Each strand of garland comes with 300 warm white lights. And at night, it’s such a pretty sight to see all light up! I am pretty sure, it’s going to help get the whole neighborhood into the holiday mood. I especially love the look of the JOY sign. It’s such a fun way to add Christmas cheer and a sweet holiday message to the front door. I set all of the lights on a timer so as soon as dusk arrives, my lights are on. Who doesn’t want to enjoy this holiday display to the fullest?! Hopefully no matter what your Christmas decor style, you found some helpful tips to decorating your home. Remember, the decor doesn’t have to be complicated or over the top for everyone to enjoy the joy of the season. For more decorating inspiration and Christmas cheer, check out the Holiday Style Challenge series on the blog. Find holiday decorations at The Home Depot.